How Much Does a Kitchen Remodel Cost in 2019? The A, B, C’s of a kitchen remodel are the appliances, backsplash, cabinets, flooring, the kitchen sink, and a whole lot more. However, the expense of a kitchen renovation hinges on the aspiration, inclination, and budget allocation of the homeowner. According to an insightful study published in Houzz magazine, half of people included spend between $15,000 and $50,000, and the most common budget for those upgrades is $25,000 – $50,000. However, you could spend a lot more or much less. Their study found that nearly ten percent spent over $100,000 and four percent spent under $5,000. The most common updates were backsplashes, countertops, and sinks. Although the following figures are for each project done separately, you’ll likely be able to save on each project when completed as part of a total kitchen remodel. However, these amounts will give you an idea of how much money each specific area of the kitchen will require. Then, you can add items together that you want completed to come up with a budget objective. Stainless steel appliances have been the favorite for kitchen remodels for years. Now, enamel-coated steel in various colors is making a comeback. A side-by-side refrigerator-freezer will cost from $2,000 on up, contingent upon the size and model. A new dishwasher is about $400 – $1,000 and will require more for installation and even more to switch plumbing. A new range costs between $700 and $2,000. If you include a washer and dryer, budget another $1,200 – $3,000. Although it largely depends on what you get, figure between $5,000 – $20,000 for the whole set. Of those surveyed, ninety percent said the backsplash was part of their kitchen revamp. How much a new backsplash will cost largely depends on the material, how much area will get covered, and the price of labor. The national average is $1,000, but a DIY with adhesive mats or could be as little as $2.00 – $5.00 per square foot. Therefore, the average 16 square foot backsplash is $32 – $80, not counting new tools or additional supplies. The national average for 30 linear feet of new cabinets is $5,000. Linear feet are the same as feet; if you have 15 feet of cabinets under the sink and 15 above, then you have 30 linear feet of cabinets. The price will depend on whether you choose off-the-shelf, “stock” cabinets, semi-custom, or custom-made cabinets. For custom-made, you could pay as much as $15,000 – $30,000. However, if you currently have solid cabinets, there is nothing saying you need to replace those, you could repaint, refinish, or reface them and have what looks like totally new cabinets. The top choice in a kitchen rebuild is new countertops. Ninety-five percent of those doing a kitchen rejuvenation chose to install new countertops. Although the price depends on the material and amount needed, the national average to replace or add kitchen countertops is $3,000. You could choose marble, slate, granite, or a wide variety of natural and manufactured materials. The first step in kitchen flooring is to decide if you want to refinish your current floor or replace with a new one. Explore more on the costs to refinish a hardwood floor. The average cost to replace a hardwood floor is $2,500 to $7,000. Tile is also an attractive option and generally costs about $1,300 to $2,500 for a typical kitchen. Using a product like laminate can allow you to achieve the look of hardwood for less cost, it is generally less stable in high moisture areas like a kitchen. Keep an eye out for laminate products that are moisture resistant. Laminate generally runs about $1,500 to $4,000. There are surely lots of light to choose from for your kitchen. However, hiring an electrical contractor to install one lighting fixture is between $235 and $325. You’ll also need to consider if you’ll be adding ceiling fixtures, recessed lighting, under cabinet, and over cabinet lighting. 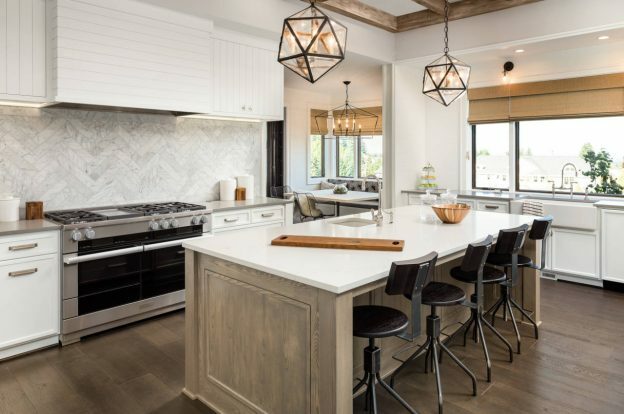 The cost of fixtures can go up dramatically if you opt to install several different lights, but the payoff of a brighter kitchen may be well worth the investment. The national average for a single-bowl sink is $220 for a thirty-three-inch stainless steel sink; the same size double-bowl sink is $300. These typically cost $380 – $400 for plumbing, installation, and hardware. Many people, when deciding how to refurbish their kitchen, want a clear view of the rest of the house from the kitchen table. They end up deciding to cut out unnecessary walls. Some walls are load bearing and cannot get eliminated without substantial expense. Removing a non-load bearing wall cost between $500 and $1,000. However, replacing a load bearing wall with a stretch beam will run between $1,500 and $3,000, and as much as $10,000 for a multi-level home. Whichever method you choose, you might need to replace sheetrock on some walls. Refer to our drywall, paint, and wallpaper cost guides to be better informed on the price of finishing the new wall. Quite often, the least expensive and most convenient method of modernizing your kitchen is to use one contractor. That may require him or her to subcontract the electric and plumbing, but they usually use subcontractors they know they can depend on, so unless you have a particular plumber or electrician, let the contractor handle it. However, there’s nothing saying you have to, but you might be able to get a better deal doing some projects separately; especially if you know someone that specializes in that area. Get as many estimates as you can for your kitchen remodel because the price can vary significantly, but always choose the contractor you can trust rather than the one who gives you the cheapest price. Make sure they have a contractor’s license, insurance, and get permits before they start.